Sometimes comic artists will use a cover to create intrigue. They’re not always accurate to the content inside. Sure, it looks like Tarkin might be hunting Darth Vader in Darth Vader #18, but surely that’s not what’s going on. And yet sometimes a cover is accurate, because that is exactly what’s going on. Tarkin vs. Vader. It’s a match I never really contemplated. I mean, Tarkin is old. He doesn’t have the Force. How can he fight Vader? Well, Charles Soule gives it a shot. The issue jumps right into it without explaining anything. Tarkin is on some planet called Chandar’s Folly in the middle of a camp. With a flip of the page, we get a view of a beat up Vader with an animal skin serving as a cape. 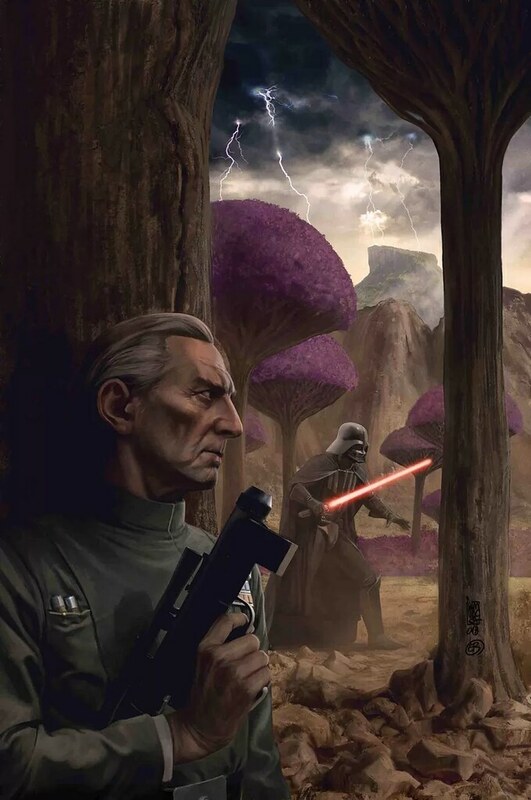 Tarkin is surrounded by other hunters, and Vader is their prey. From there, the comic explains how Tarkin has tried to defeat Vader. His attempts to study his weaknesses. Plus the many people he has lost in these endeavors. Eventually there’s a showdown and surprisingly enough, Tarkin seems to win. The comic reveals, in part, what this hunt was about, and Vader shows he’s not dead yet and Tarkin shouldn’t be so smug about his seeming victory. Now on one hand, this story is kind of interesting. It’s weird, and it hasn’t been done before. We’ve seen Tarkin and Vader team up, but we’ve never seen them actually fight each other. Not to my recollection. Here, we see them go at it. Tarkin pulls out his skills as a hunter, which was laid out by James Luceno in his book, Tarkin. Vader pretty much just brute forces his way to victory with some cunning here an there. But the idea of Vader asking Tarkin to hunt him. To try and kill him, it’s kind of fascinating. What was his motivation? In a way, I like that Soule doesn’t spell that out. It’s left up to the reader, at least for now. It makes for an interesting story. On the other hand, does this diminish Vader? The Dark Lord of the Sith, laid low by an old man and some mercenary hunters. Should they have really been able to damage Vader in the first place? We’ve seen Vader do some pretty incredible things in the Marvel comics. He was a one man army in Vader Down. With Darth Vader #18, the story does not make Vader seem more fearsome so much as it seems to make Tarkin more fearsome. Here’s an old guy who should not be underestimated. And while Vader did get that last blow in, one that could have killed Tarkin if he wanted to, he was outsmarted by Tarkin nonetheless. This story has a very standalone feel to it, which makes me wonder where Soule is going with the series, and how this story will setup what’s coming or how it will be used in the future. It’s a curious what if adventure brought to life, but it raises a lot of questions. Though, to be honest, my only true gripe with this issue is the artwork. I’ve never been a fan of how Giuseppe Camuncoli portrays humans, and he has a tendency to make Tarkin look monstrous. He does the same with Palpatine. It’s an artistic flair. But that aside, I liked this issue, and I give it a four out of five metal bikinis.